You might have noticed the lovely Broadmoor Broadway Village Neighborhood located in central Tucson just south of Broadway between Tucson Boulevard and Country Club Roads. But did you know that Broadmoor Broadway Village is a showcase of how a neighborhood can be transformed into a colorful community gathering place? Reading the history of the Treat Walkway is practically a step by step guide for growing and maintaining green infrastructure and livable streets! 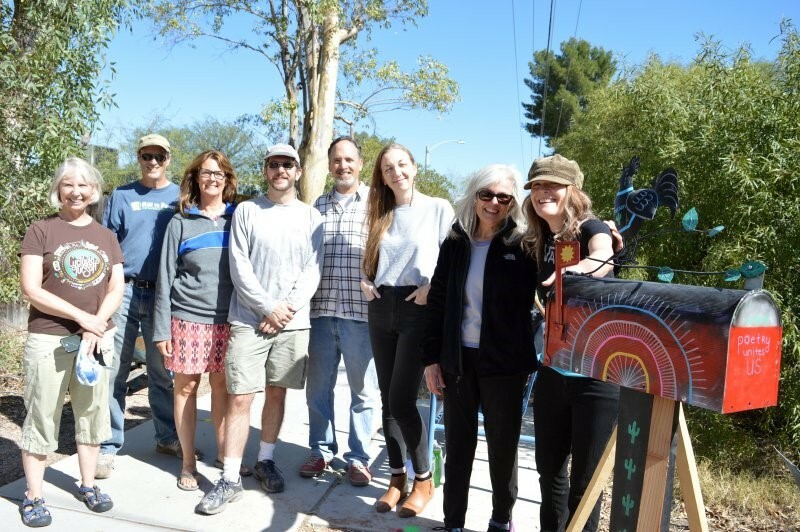 The neighborhood's journey is an inspiring example of what can be done when a group of dedicated people work together with landscaping experts, neighborhood artists, and the city to create walkable/bikeable streets shaded by desert trees where neighbors can enjoy being outside and being together. These neighbors didn't just build a walkway, they built a caring community. The origin of the Treat Walkway goes back to the original design of the Broadmoor neighborhood in 1945. A six block easement connected the neighborhood from north to south. The easement allowed neighbors to walk from the north end to the south end of the neighborhood without walking next to cars. The north end was one block from Broadway and with it, a whole series of shops, restaurants, and other retail establishments. The south end was one block from Robison Elementary, a TUSD school with long ties to the neighborhood. In the middle of the Treat Walkway lies Arroyo Chico, with its own walking paths on the north and south sides, which connect Tucson Boulevard to the Reid Park multi use path and beyond. From the 1940’s until 2011, the Treat Walkway was an unpaved easement with uncut curbs. 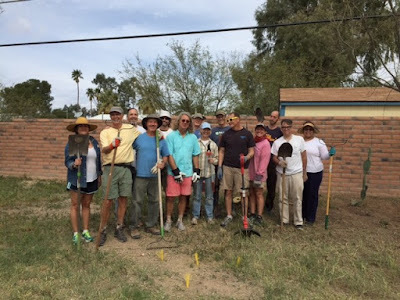 While several neighbors planted desert trees, shrubs, and cacti, much of the walkway easement was uncultivated dirt, hot and dusty in the summer, muddy during the monsoons, and unnavigable by neighbors in wheelchairs. When Broadmoor Broadway Village became an official neighborhood under the leadership of neighborhood President Connie Anzalone in the 1980’s, improving the Treat Walkway was made part of the neighborhood’s strategic plan. They prioritized the living environment of the neighborhood. 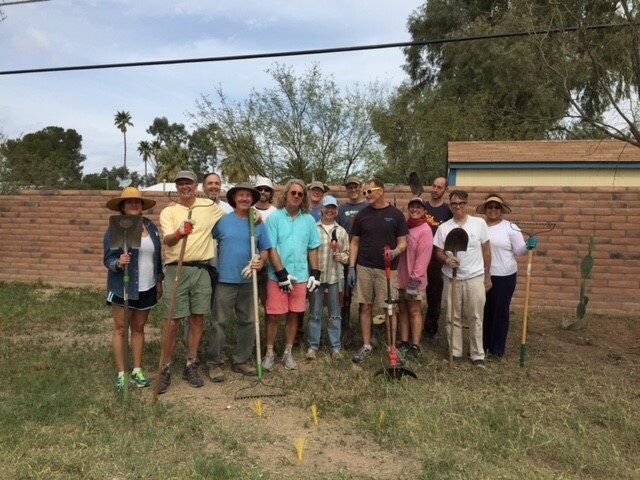 In 1987, Connie Anzalone wrote the “Broadmoor Broadway Village Urban Forestry Manual.” Long before “Climate Change” became a household word, Connie defined why the greening of in-town neighborhoods should be a priority for the City of Tucson. 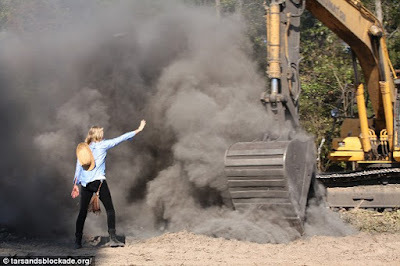 Connie Anzalone was well known for being a neighborhood leader who joined with other neighbors to stand in front of Army Corps of Engineers bulldozers that were poised to remove all the vegetation from Arroyo Chico and channelize the wash with concrete in the early 1980’s. Because of the efforts of her “little old ladies club,” Arroyo Chico remains un-channelized with native trees along much of its banks. In 1991, sections of the Arroyo Chico wash at the east and west ends of the neighborhood were unplanted dirt, hot, dusty, and uninviting entrances into the neighborhood. The neighborhood hired permaculturist Dan Dorsey to draw a design to plant mesquite, acacia, Palo Verde, and Texas Olive trees along the top of the banks of Arroyo Chico. Neighbors used an augur to drill planting holes and trees were planted. The neighbors watered the trees periodically when young until they were large enough to live on their own. Today many of these trees are more than 30 feet tall, and form beautiful entrances into the neighborhood. In 2006, BBVNA won a Pro Neighborhoods grant to build the first water-harvesting pocket park in the City of Tucson: Malvern Plaza. 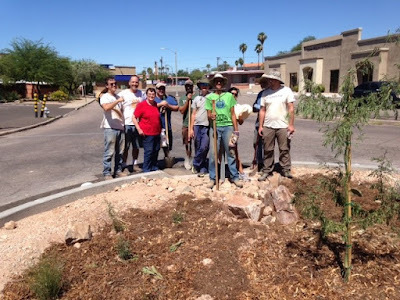 In 2008, at the intersection of Malvern Avenue and Arroyo Chico, a large swatch of asphalt was removed by City of Tucson work crews, basins were constructed, and Palo Verde, Mesquite, and Netleaf Hackberry trees were planted. Today, the trees are more than 20 feet tall. During the monsoon rains, the basins flood with water from Malvern Avenue, replenishing the trees. The plaza is otherwise unirrigated. Suzie Husband started a neighborhood effort in 2007 to create beautiful tiles that decorate the tops of the cement tables, making the plaza an inviting location to stop and sit and converse with neighbors. Today you can also read a book from the Little Free Library at Malvern Plaza. Many neighborhood events take place in the Malvern Plaza, including but not limited to: the Plant Swap, Movie Night, Octoberfest, Meet and Greets, Yoga, and others. The Malvern Plaza remains a gem of the neighborhood, and for the City of Tucson! 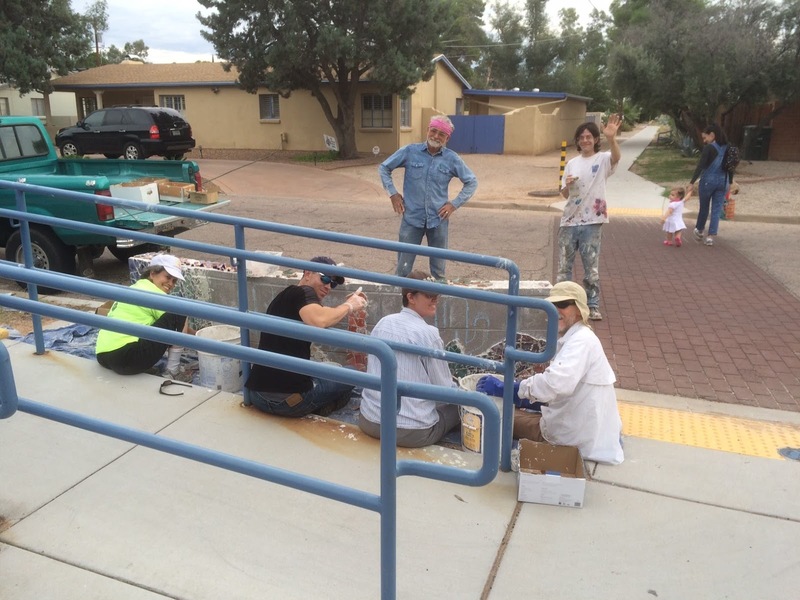 In February, 2011, construction began by the City of Tucson on the Treat sidewalk. Enhancements included wheelchair ramps at the pedestrian bridge over Arroyo Chico, the construction of two low walls at Arroyo Chico, the installation of benches, curb cuts at the street, and pedestrian crossings at each street. After the sidewalk was completed, discussion turned to enhancing the sidewalk with vegetation and shade. The only problem: much of the walkway was without vegetation, the easement was used by T.E.P, Southwest Gas, and the city of Tucson, with both above ground and underground utilities, there were no designs to convince vested entities about what we were planning, the neighborhood had no budget for buying plants, there was no irrigation along the walkway, and few of the residents along the walkway wanted to use their water spigots to water plants that were on a neighborhood easement that was not their own property. U of A landscape architect Oscar Blazquez provided beautiful drawings, and even an animated video showing what it would be like to walk down the as yet unplanted sidewalk. Neighbors met with Tucson Electric Power, Southwest Gas, and the City of Tucson and showed them our drawings, and discussed what we were planning. The utilities stated their concerns: the plants should not impede utility vehicles from accessing their poles, lines, and meters, the underground utilities should not be cut when the neighborhood dug holes to plant trees and plants, and large trees should not be planted under power lines. With these parameters set, the utilities gave their blessings to planting the Treat Walkway. A neighborhood work day was announced. A large contingent turned out. Neighbors brought gloves, shovels, rakes, food, and water for thirsty workers. The three Palo Verde trees planted at the corner of Exeter and the Treat Walkway exist to this day, and are some of the biggest trees on the walkway. Around this time, Ann Pattison and Richard Roati were walking the neighborhood seeking input on obtaining Historic Designation for the neighborhood. 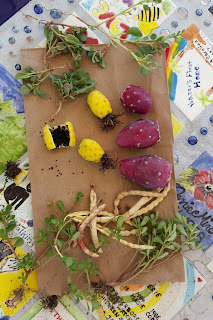 They noticed agaves, aloes, and prickly pear plants in neighborhood yards and ask the neighbors if they would be willing to donate plant pups or plant sections for propagating plants for the Treat Walkway. The Treat Walkway Nursery was born. As plant pups, sections, and divisions were collected from neighbors, they were placed into plant pots and grown until reaching sturdy 5 gallon size. We found that plants grown in 5 gallon pots for six months to a year tended to survive better when placed onto the walkway than unrooted plants planted directly. The plantings were arranged so that rainfall from the sidewalk and the surrounding area flowed to the plants, providing enough rainfall to sustain them without supplemental irrigation. In addition to providing shade and beauty, many of the plants on the Treat Walkway are food sources to both wildlife and people. Mesquite Trees provide pods which can be ground into flour. Palo Verde beans can be eaten like peas when green or dried and cooked. 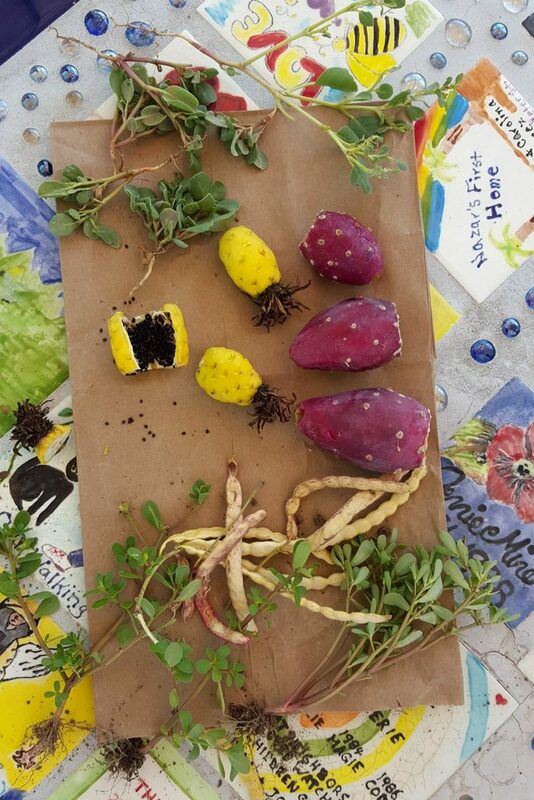 Prickly pears provide nopalitos and prickly pear fruits. Chollas provide cholla buds. Agaves provide fibers and edible hearts or “pinas.” Peruvian apple cactus provide edible fruits. Purslane or verdolagas are harvested after the monsoon rains. Many of the uses of these foods are detailed in books such as “East Mesquite” by Tucson Desert Harvesters. But as the neighborhood moved north a section of caliche was found. In order to plant the three Palo Verde trees just north of Devon Street, a jackhammer was required to provide drainage. The bottom of the caliche layer was never found. 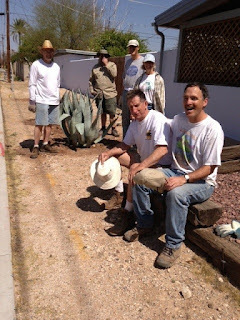 At one point it took more than two hours to retrieve a stuck jackhammer blade from the clutches of the dreaded caliche. Still, the trees took hold, and are growing successfully on the walkway. In 2014, the City of Tucson provided funds through the Treat Bicycle Boulevard project to work with Watershed Management Group to install a traffic circle. Because the Treat Walkway is a narrow sidewalk, often filled with neighbors walking their dogs, runners, parents with baby strollers, etc., it is not really wide enough to be a multi-use path. Bicyclists in a hurry find that it is faster to take the designated route than to attempt to ride on the Treat Walkway. In 2015, a young bicyclist unfamiliar with the area rode his bicycle south on the Treat Walkway and ran into the side of a car traveling west on Exeter Street, breaking his foot and was taken to a hospital in an ambulance. 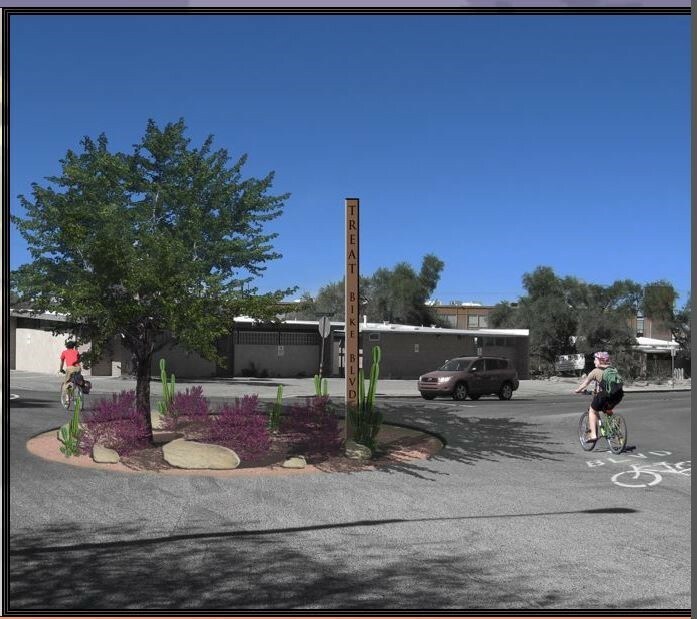 Since that time, the City of Tucson installed signs and sharrows encouraging bicyclists to use the designated route when traveling the Treat Bicycle Boulevard through the neighborhood. Bicyclists riding the designated route as well as cars encountered a dangerous intersection at the corner of Manchester and Stratford Avenues. It was often unclear as to who had the right of way while traveling through the intersection. Also, the intersection was an entrance to the neighborhood that presented an unnecessary “sea of asphalt” to visitors that did not represent the values of the neighborhood. The solution was to install a traffic circle at the intersection. Once again, it was the design of Oscar Blazquez which helped to convince the city to install the traffic circle. The city dug out the pavement and Watershed Management Group staff member Kieran Sikdar directed neighbors in the planting of rocks to direct storm water into the traffic circle, and to plant the circle. .In October, 2014, the neighborhood planted the section of the Treat Walkway between Croyden and Exeter streets. Many of the plants planted on the west side of the walkway can be seen to this day, including Tucson Prickly Pear, yellow flowering aloe plants, octopus agave, mesquite, and Palo Verde trees. In the spring of 2015, neighbors awoke one day to find graffiti with a bullying message aimed at a young resident on the cement sides of Arroyo Chico. 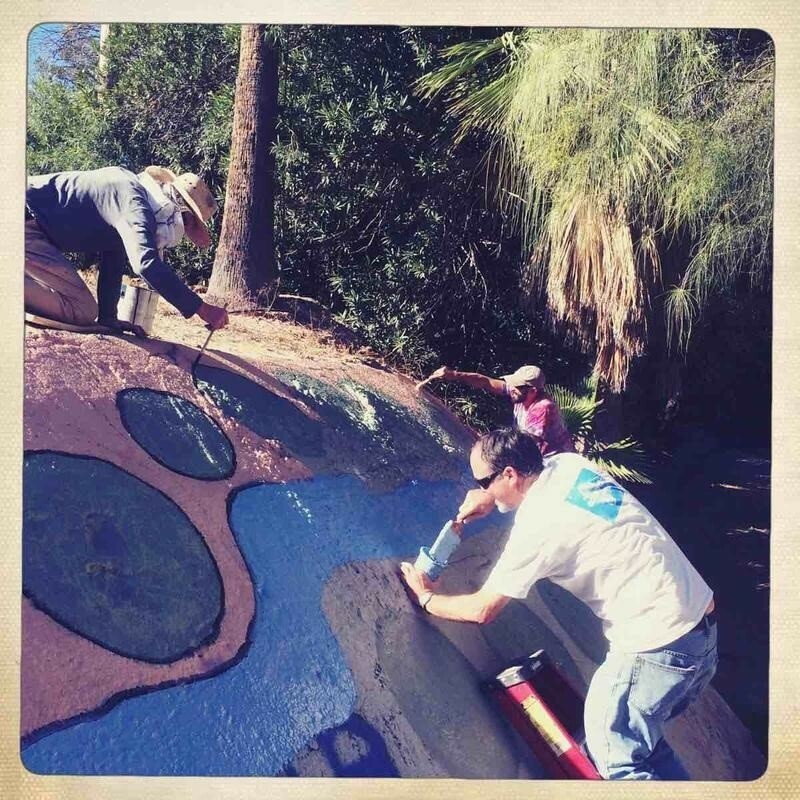 Neighbors sprung into action and in just a few hours, painted two murals on the cement walls. Luckily, after the mural paintings, the graffiti did not return. 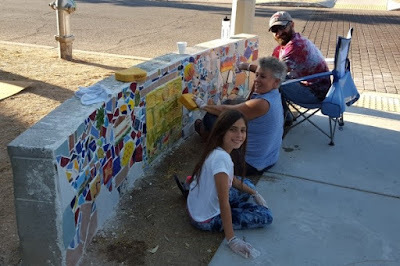 In 2015 the neighborhood partnered with the Tucson Arts Brigade (TAB) to create a tile mural on the two low walls that the City of Tucson installed as part of the Treat Walkway sidewalk installation. Working with TAB, neighborhood residents hand painted clay pieces that were fired and then installed on two sides of the walls. In October, 2015, the City of Tucson completed the installation of a “HAWK” traffic light at the intersection of Treat Street and Broadway Boulevard. A HAWK beacon (High-Intensity Activated crossWalK beacon) is a traffic control device used to stop road traffic and allow pedestrians and bicyclists to cross a street safely. Suddenly, it was easy for Tucson residents living south of Broadway (such as in BBVNA) to walk or bicycle to Himmel Park and the Himmel Park library, visit shops such as Rincon Market, and dine at restaurants It was also easier for residents living north of Broadway to walk or bicycle to shops and restaurants at Broadway Village. In March, 2017, neighbor and poet Elizabeth Salper won a grant to install a poetry mailbox on the Treat Walkway. The idea of the poetry mailbox is to “give a poem, take a poem.” Elizabeth fills the mailbox with poetry (as well as chalking poems along the walkway periodically). 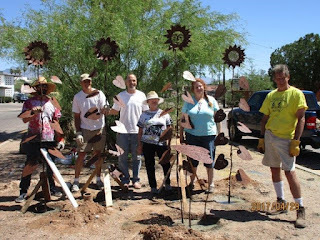 In 2016, artist Ellen Abrams proposed a memorial consisting of metal flowers, dedicated to all BBVNA neighbors who had passed on, including her sister, Linda Abrams. Efforts to maintain the Treat Walkway and other vegetated areas are ongoing. As in nature, some plants die due to insect infestation, drought, or old age. As some plants die, new plants are added to replace them. In addition to the Malvern Plaza, the Little Free Library, the Poetry Mailbox, the traffic circle at Manchester and Stratford, the Art Memorial on the median at Manchester and Eastbourne, the Treat Walkway remains one of the major features of the Broadmoor Broadway Village Neighborhood. Residents often walk with their children and their dogs along the walkway, meeting and talking to their neighbors as they go. 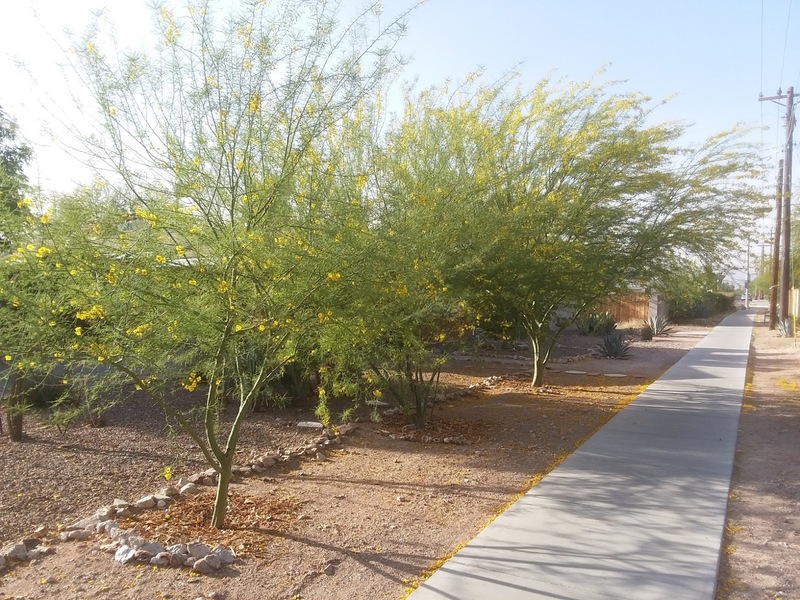 Palo Verde and Mesquite trees provide shade to the walkway and make it more inviting and pleasant. As the Treat Walkway has become more inviting to neighbors to visit, crime has been reduced and neighborhood interaction has increased. The trees and other plants on the Treat Walkway continue to grow and shade continues to increase. The Treat Walkway has become one of the unique features of the City of Tucson. 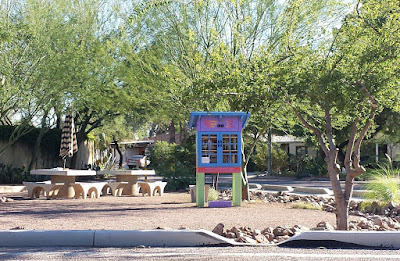 As one of the first planned subdivisions built after World War II and a pioneer in urban forestry, Broadmoor Broadway Village Neighborhood is an important part of Tucson’s history. 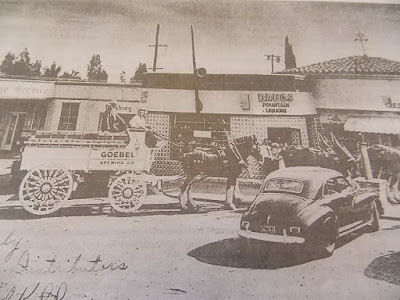 It sits adjacent to three historic neighborhoods: Sam Huges, Miramonte, and Colonia Solana. The people who worked so hard to build this lovely neighborhood with green infrastructure and livable streets watch anxiously as development encroaches on their backyards. Three seven story apartment buildings have been proposed for the Benedictine Monastery site on Country Club Road, and a 20 story apartment complex proposed for the corner of Campbell and Speedway. As a neighborhood of single family homes, their properties are under threat because of their proximity to the U of A – that is perceived to be worth more with high rise apartments. But this is one neighborhood that won’t go down without a good fight. The neighborhood is currently in the process of applying for historic designation from the State Historic Preservation Office to protect the neighborhood from overzealous development. Connie Anzalone and her “little old ladies club” would be proud! Thanks, Jana! We are so thankful you built this page. Anyone sharing this page with their friends and commenting on this page that they did so, by Saturday, April 14, 2018 will be entered to win two free tickets to our fundraiser at Laffs!